Editors' Note: There is a photo and a video associated with this release. BlackBerry Limited (NASDAQ:BBRY) (TSX:BB), a global leader in mobile communications, today announced that it has released several new features for BBM™, offering users new ways to chat and share with more privacy and control over their communications. 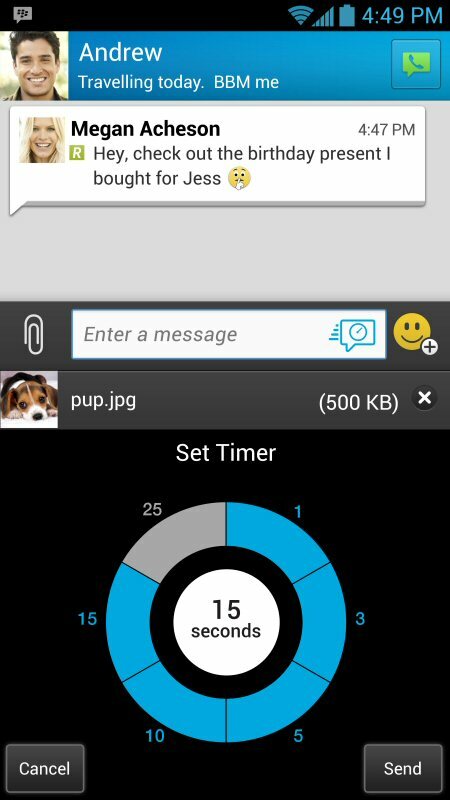 Timed Messages(i): By setting a timer you can control how long messages and pictures you share with contacts can be viewed within BBM. The message is hidden until the recipient touches and holds on the chat. Then, once the timer has expired (or if the recipient takes their finger off the screen), the message is no longer visible. The user also receives a notification if BBM detects that the recipient has taken a screenshot of the image or message. Message Retraction(ii): Users can now retract their message to remove it from their BBM chat before it has been read by the recipient or after it has been read so that it is no longer visible within the BBM chat. High Quality Image Transfer: When a user receives a picture in BBM, they can quickly request an HD version to enjoy the image in full detail. Faster Sticker Selection: It is now easier for users to browse BBM Stickers and quickly add them to their chats. Discover New Music: See what music BBM contacts are listening to and show others what songs you're playing. iPhone users can tap the song and be taken to iTunes for a quick and seamless purchase. "These new enhancements to BBM were highly requested so we're excited to be delivering them to users today," said John Sims, President Global Enterprise Services at BlackBerry. "These capabilities will allow our users to be more creative in how they deliver their messages while also being confident that their content is kept private and seen only by its intended recipient." Timed Messages and Message Retraction are premium features that will be available free and without restriction to BBM users over the next three months. After this time, unrestricted access to these features will become part of a broader bundle of features that will be offered as part of a BBM subscription. Today's announcement underscores the commitment to making BBM a world class privacy-focused instant messaging application. New features are available for download over the next couple of days for BlackBerry 10 smartphones, iPhones and Android smartphones by installing the latest BBM update in BlackBerry World, Apple App Store and Google Play. For more information, visit the Inside BlackBerry Blog and check out new BBM videos on the BlackBerry Youtube Channel. (i) While the timed message feature is designed to remove the message or picture from the recipient's BBM chat view, it does not prevent recipients from capturing an image of the content by taking a screenshot or using an image capture device. (ii) Retracting a message after it has been read by the recipient will remove the message from the BBM chat view, but will not affect copies of the message that the recipient may have made prior to the message being retracted.